Thanks to JBM and Daily Script read this January 6, 2005 revised draft script of Fracture by Dan Pyne. That is over on the movie scripts page. Thanks to Donovan and Daily Script and Awesome Film we have a great compare and contrast moment. On Daily script read a revised first draft of David Webb Peoples’ Soldier which you can compare with a transcript of the final movie where Tony Gilroy and Paul W.S. Anderson made some changes. – The script and transcript would be on the movie scripts page. Folks, our own Phil went to a script pitch last night. Here is the report. There is some valuable information here that I thought I’d share. You can also add your own insights on the Discussion Board. I attended the pich meeting last night and pitched both The Burnout and A Druid’s Guide to the Northeast. I found it worth the time, effort and money I put into it. I first pitched The Burnout and bombed out terribly. Larry and associates actually stopped me in mid pitch to tell me I was going about it the wrong way. I brought a fifteen page story synopsis and told them them the story with way too much detail. Looking back, I can see where I went over the top with the details, going as so far as to use different voices when the characters talked. I won’t even bring up the platinum-haired finger puppets. Larry said that a proper pitch is telling them the name of the script, presenting the logline and a very brief synopsis. A pitch should be a dialogue where you want the producers to ask you questions in the short time you have with them. They were pretty cool about the whole matter. About an hour later, I pitched [A Druid’s Guide to the Northeast]. I didn’t refer to my fifteen page synopsis and instead kept the synopsis extremely short. Maybe five lines. Right after I gave it, they started asking questions. What’s a druid? Are they real? What’s a water elemental? How ‘magical’ is the movie? When all was said and done, they asked for a copy of Druid. Thanks to Rob for the heads up on this one. Paramount Vantage brings us this April 9, 2005 unspecified draft script of Babel by Guillermo Arriaga. And, thanks to Dennis for the heads up on this one. Weekly script brings us the winner for Best Screenplay at the 1998 Cannes Film Festival – Henry Fool. Skip on over to the Movie Scripts page to check them out. Thanks to Evan for the heads up on this from You Know, For Kids!. Read the November 28, 2005 draft script of No Country For Old Men by Joel Coen and Ethan Coen (based on the novel by Cormac McCarthy). It’s in pdf format. Thanks to Donovan and Daily Script read this early draft of U Turn (formerly “Stray Dogs”) by John Ridley (before Richard Rutowski and Oliver Stone edits). Thanks to Dan for the heads up on this recent addition to the best Back To The Future fan site in existence. BTTF.com brings us the first draft by Bob Gale of Back to the Future II. It begins very much like the released movie, then deviates quite a bit. See what BTTF II (and III) could have been on the Movie Scripts page. On the Unproduced Scripts page we have fifteen new scripts up for your reading pleasure, including therein is the season finale (finally) of Wesley’s Better Days as well as a couple more episodes of Season II of Better Days. haha. On the Unproduced Scripts page we have fourteen new scripts up for your reading pleasure. 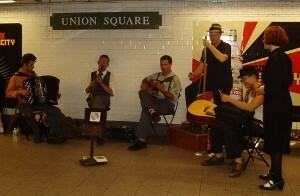 Judy just returned from New York where, among her other adventures, she had the chance to catch Loose Marbles playing in the Union Square subway station. She bought their CD – no label save for “loosemarbles (a) gmail.com written on the back. The tracks are unmarked. I slipped the disc in and was hit with the most insanely incredible New Orleans Jazz music. No, it was hot jazzy Nawlins goodness. Judy was lucky enough to also be able to catch Chance and Amy jitterbugging like nobody?s business and Meshiya Lake belting out tunes, unmiked, above the sound of the band. Dan Baum describes Loose Marbles as, “…a sort of Amalgamated Jazz Corporation. The fifteen musicians play clarinet, trumpet, banjo, washboard, accordion, trombone, guitars, sousaphone, standup bass, and guitars. The music varies depending upon who is playing.” This is an eclectic group of people who range from University music-school graduates to rail-riding, outdoor-living hobos who all have a love for Jazz. Click the You Tube link and listen for yourself. Also, check out Dan Baum’s article on Loose Marbles as well as James Heil’s photo documentary of itinerant street players. Fixed the broken link to Zodiac. Thanks to Melson for the heads up.